Compact wireless switch featuring a proximity sensor activation surface that activates when a body part is within 10-mil of the surface. 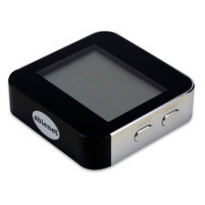 Includes integrated rechargeable battery, auditory beep and visual feedback. Wireless receiver required. Mini Beamer Transmitter comes with a modern look, small form factor, rechargeable battery, proximity sensor activation surface, and external switch jack. Proximity sensor will activate when an individual is within 10-mm of the activation surface.